There’s a lot going on in this tiny, but striking carnival glass bowl - vibrant, iridescent color; three crisp and distinct pressed glass patterns; and ball and claw feet. The Fenton Art Glass Company first introduced iridized or carnival glass in 1907. By the following year, carnival glass (pressed glass with an applied iridescent coating) was in large-scale production as the Fenton brothers developed an inexpensive way to mass produce the pretty glass. Instantly popular with the buying public, Fenton sold as much as they could produce becoming one of the top manufacturers of carnival glass, making over 150 patterns in numerous shapes and colors. This piece measures 5 1/4" in diameter and is 2" tall. The flared and scalloped sawtooth rim completes the heavily designed piece. The outer pattern design is Butterfly and Berry; the inner patterns are: Heart and Vine and Panther. The marigold or iridescent orange color is bright. 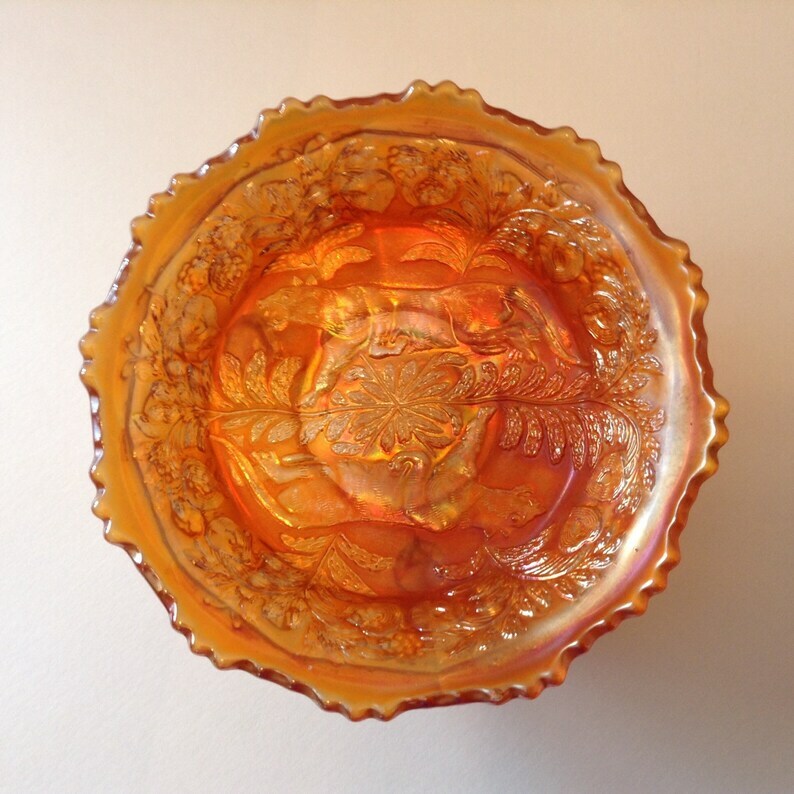 The bowl is in very good vintage condition with typical wear due to age and handling. The piece is chip-, nick-, fleabite- and scratch-free. There is; however, a line in the glass going through the shoulder of one of the panthers (see photo five, top panther). The line can be seen but is not felt from either side. Unfortunately, I do believe it is a fracture or crack (see photos six and seven). There are also a few scattered bubbles in the glass - again see photo five at 11 o'clock and photo one at 11 o'clock.